Companies hire many regular full- and part-time employees but often extend employment agreements to independent contractors (ICs) as well. ICs, sometimes also called consultants, freelancers, contractors, or free agents, are usually hired to perform certain projects and their employment is considered temporary. In the past few years the American economy has gone through thousands of lay-offs. Even though many of those individuals were able to find a new job, some decided to start offering services on their own and work independently. For those new to this concept or considering this type of work setting, there are issues to consider. 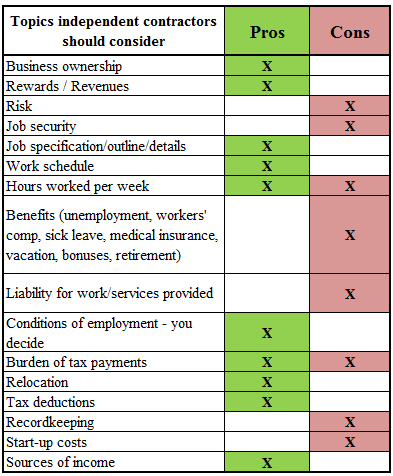 Below is a general table of some pros and cons of working as an independent contractor and other considerations. Some categories fall into both depending on how long a business has been operating and economic conditions. I made some additional comments and clarifications below the table. Before I continue I would like to mention that sometimes companies hire workers and for tax purposes consider them independent contractors even if their job conditions are no different from the regular full time employees. In a recessionary period when companies have upper hand in hiring they may abuse their power, as people are strapped for work. Other times it’s done inadvertently as workers are hired temporarily but their job continues without any fix end date. This practice puts workers at disadvantage and it’s walking a thin line, as a worker in this scenario most likely does not fit into a category of independent contractor. If you feel like that’s you, perhaps you should check with human resources and ask to have your employment status reviewed. Are you an Independent Contractor? Then see our post on how to do your taxes. Everyone who is considered an independent contractor even without setting up a formal business should think of himself/herself a business owner (from now on I will consider you as one). You are in the business in trading your time and skills for some form of payment. This will help you think more professionally and competitively about what you have to offer. You will also look differently on benefits that are offered to independent contractors and ideally take advantage of them. Starting to work independently is challenging and will require additional effort and time to market yourself and find customers for your services; this will require you to work much more than 40 hours per week without any overtime payments; it’s when you finally establish yourself that your workload may diminish and you can even contract others to collaborate on projects for you and help you out with simpler tasks. Tax payments become your requirement which is definitely undesired at the beginning; with time you get used to making payments and doing that every three months is not the end of the world; additionally you get to keep the gross amount of your revenue until the payment is due allowing you to better manage your cash flow; having that money in your account puts you in charge and allows you to consider options that might include earning some income for having the money deposited in your account or temporarily paying off high interest credit cards until the tax payment is due. I should clarify Recordkeeping. It is very important to keep track of all your business expenses as they may qualify for deductions. Business deductions for independent contractors is one of the greatest benefits because if managed properly they can substantially lower your tax obligations. It is not as easy as it appears though. There are quite a few aids to help you keep control of the paperwork but in the end it takes character and your organizational skills to do it right. I would suggest setting up a system that you will follow no matter what because once the business grows the paperwork pile might be too much to dig yourself out of. Doing it right will come handy in case of disputes or audits; it is also a good business practice. Relocation – this feature allows you to pick a place you always wanted to live in and just go as you still have your skills; it might take more work initially as you cannot take your customers with you (unless your services can be provided over the phone or the Internet) but you can perhaps get into the market where there’s more need for what you have to offer or any other reason. Sources of income – having just one job is rather risky as your financial health depends on one source of income; if you manage to offer your services to various customers (or even one customer for different projects) you diversify your money inflows so even if you lose one customer you still can make money elsewhere. All the rewards are for you – the more you work the more you can make; you will never have to complain again that your coworker makes as much money as you doing half of what you contribute. Working independently is not for everyone but America is built on small businesses and the system is well equipped to help anyone succeed. There are risks and uncertainty but there are many government and community resources to get anyone started. Self-employed can look into National Association for the Self-Employed or the IRS. I also recommend visiting a local chamber of commerce for help getting started, orientation of what it takes, and what they have to offer to help your business be successful.